Many years ago, while I was a student in Italy, a good friend would come to our apartment a night each week and teach my roommates and me how to cook. The meals were always simple yet hearty and contained few, though high-quality ingredients. He taught us that even just a little bit of a really good cheese will add depth and earthiness to a pasta. The olive oil should be one of quality where, if you take a sip, you’ll feel a hit of pepper in the back of your throat. If it makes you cough, it’s good oil and good for you, he told us. And always, always salt your pasta water, he taught us, salty like the sea. This dish reminds me of one we used to prepare in our cozy Tuscan kitchen back in the day: fat tubes of pasta cooked al dente (firm to the bite), with greens sautéed in olive oil and garlic. The dish would be topped with toasted pine nuts and a nice sharp pecorino cheese. Sometimes we’d crumble up and brown a link or two of spicy sausage or add a bit of leftover chicken to bulk up the dish. I think some large shrimp (leave the tails on for a pretty presentation) quickly sautéed in a bit of olive oil with garlic would also be heavenly. This dish is especially delicious on a cold, rainy night with a bottle of Chianti and good company. Chiffonade the kale by cutting it into long, thin strands. In a sauté pan over high heat, add olive oil and minced garlic. Cook the garlic until fragrant, about 3 minutes. Be careful not to burn it or it will become too bitter. Add kale and cook until al dente (until just tender), about 3 minutes. Remove pan from the heat and set aside. In a large pot, add water and salt. Place over high heat and cover and bring to a boil. Add the rigatoni and cook according to directions on the box. Reserve 1/2 a cup of the pasta water, draining the rest. Add the rigatoni and the ½ cup pasta water to pan with kale and garlic (the pasta water will add flavor and a velvety finish to your sauce). 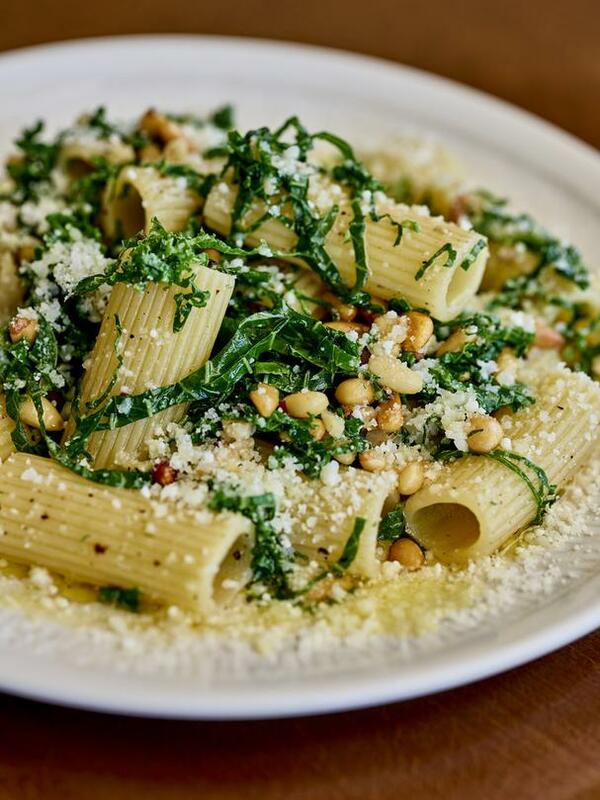 Finish with pecorino cheese and pine nuts. If you’d like to add shrimp, just saute them in a little olive oil, garlic and salt over medium-high heat. Fold into the pasta at the same time as the noodles are going in.